The Avenging Archer takes the stage in a collection of enough sensational solo adventures to fill anyones quiver! First, watch out as Hawkeye encounters a genetically engineered monstrosity created by the insidious Secret Empire. But will this feral fiend prove to be friend or foe? Then, roll with the punches as Hawkeye gets battered by Batroc, assaulted by Oddball and trounced by the Taskmaster - all in a single thrilling one-shot. Finally, duck for cover when Hawkeye participates in a rocky three-part reunion! Ready, aim, fire - this Marvelous masterpiece hits the mark! 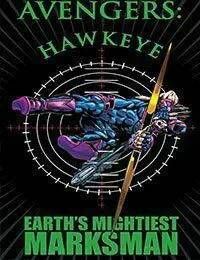 Collecting HAWKEYE (1994) #1-4, HAWKEYE: EARTHS MIGHTIEST MARKSMAN and material from MARVEL COMICS PRESENTS (1988) #159-161.